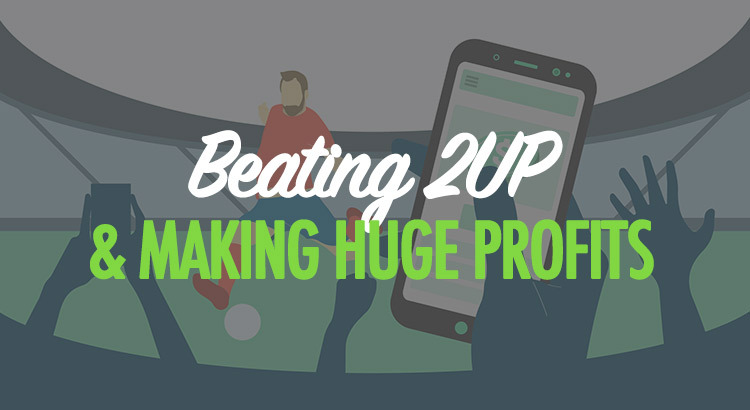 One of the most exciting offers in the matched betting world is the ‘2 up’ offer that can be found on Bet365 and Paddy Power. For those without a lot of spare time, it can give large profits for little effort (although a bit of patience will be required). For those in the early stages of matched betting, it can give bankrolls a hefty boost if luck is on side. And for those with large bankrolls, there is the possibility for four-figure profits from a single winning bet, with very minimal financial risk to go with it. In this guide we’re going to be looking at how to exploit the 2-up offer, the different 2-up strategies you can use and also a range of hints and tips for making the most profit possible. When the team you’ve bet on goes two goals in front of their opponent, you will be paid out by the bookmaker. The premise is very simple; bet on a team whose back and lay odds are extremely close or, ideally, an exact match. All you have to do after that is hope that they go two goals in the lead. This could be 2-0, 3-1, 4-2…you get the idea. This reason ‘2-up’ offers such huge potential is because if your team then fails to actually get the victory, your lay bet (on the exchange) will win as well as your early payout on the bookmaker side. If you have an exact odds match and 0% commission, you’re going to have no qualifying loss. If you’re at 2% or 5% commission, your qualifying loss will be extremely small (relative to the size of your stake) and it will be extremely +EV. Just in case this wasn’t already clear, this offer is not a standard ‘Bet X, Get Y’ basic free bet offer. It is a more advanced offer that is not going to generate small-but-consistent profits. This means you’re likely to have periods where your team regularly doesn’t go two goals in front and therefore your chance at profit is zero. This is where patience and perseverance are required. However, when your team does go two goals in front…the profits can be spectacular. Let’s now take a look at the two different options you have for profit strategies. This option is by far the most simple. However, it is also extremely high variance; you’re not likely to have many profits this way, but when you do they will be large. You back a team for £100 at odds of 5.0 and lay them at 5.0. Your commission is 0%, and your qualifying loss is therefore £0. You then do nothing else but cross your fingers and hope for the best. If your team goes 2-0 up but still wins, you make nothing and lose nothing. If they don’t go 2 goals in front, you make nothing and lose nothing. However, if your team does go 2-0 up and then draws or loses, you would make £500 profit. £400 would come from the bookmaker side and the £100 from the exchange. This is the lowest effort, highest reward option, but also the least consistent by far. Expect long stretches of no profits and some small qualifying losses. This second option, the ‘lock-in’ method, is generally preferred by most matched bettors. Back and lay as instructed above. Wait for your team to go two goals in front. However, once they do take a two goal lead and you get your early payout, you now have a decision to make. Do you want to lock in? If you do, you can generate a profit. Alternatively, you could wait and see if the other team pulls a goal back. If this happens, the odds can swing nicely and you can generate a more significant profit. Let’s look at the same example as above; you’ve bet £100 at 5.0 and laid at 5.0 with 0% commission. Your team goes 2-0 up just inside the second half. The odds on your team to win are now 1.18. 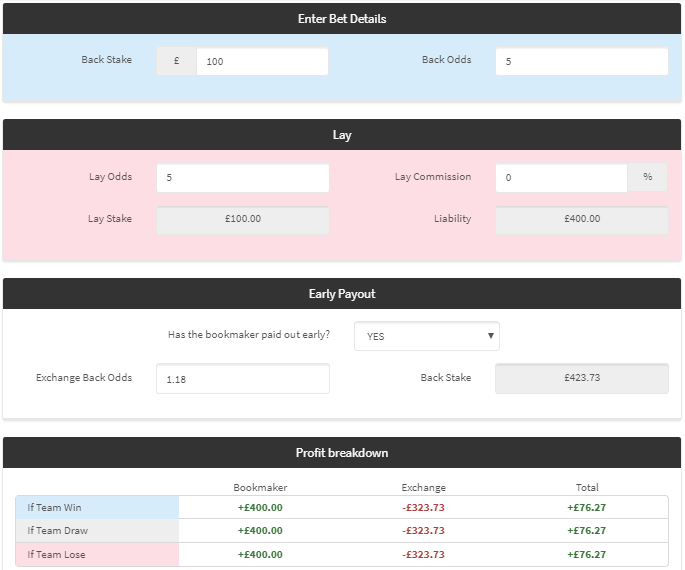 Using the ‘Early Payout Calculator’ via Oddsmonkey (free trial here) we input our initial bet stakes and the current odds. As the calculator instructs, we could now back our team again – via the exchange this time – with a stake of £423.73 and generate £76.27 in guaranteed profit by doing so. …This is because the stake will actually subtract from your liability on the bet, as you can’t win and lose the same bet simultaneously! This will mean you actually need no extra money in your exchange in order to generate the profit. Let’s say we didn’t lock-in at 2-0 and we hoped that the opposition pulled the score back to 2-1. Fortunately for us in this made up example, they score virtually straight away! Our underdog team are 2-1 up with half an hour to play. Their odds are now 1.65. At these new odds, we could now lock-in £196.97 in profit. Beginners with small bankrolls should look to lock in at 2-0 for the bankroll boost. For those with slightly larger bankrolls, waiting until 2-1 (or even 2-2) may be more favourable. The EV doesn’t actually differ when you’re paying 0% commission, but locking in earlier is slightly lower EV when you’re paying commission – this is due to larger exchange stakes. Whilst heavy favourites are likely to go 2-0 up often, they leave us with a few problems that mean they aren’t suitable for the offer. Firstly, they require huge stakes in order to generate anything significant in profit. £100 at odds of 1.2/1.2 would only return £120 in profit. Secondly, whilst they might be extremely likely to go 2-up, they’re extremely unlikely to end up drawing or losing after doing so. This means the ‘letting it ride’ strategy isn’t really viable. The other issue is that even if you wanted to lock-in at 2-0, the odds on the heavy favourite would likely be 1.01 at best. This means that heavy favourites are just worth avoiding altogether. Try for matches where you can get on the underdog, or where two teams are similar match-ups. Save an oddsmatcher filter for each league or competition that you want to bet on for ‘2 up’. The filter will be exactly the same for each, only filtering each competition separately. For example, you’d have one for the Premier League, one for the Champions League, and so on. Setting them up is the effort requirement (even though it only takes 2-3 minutes), but the important part is that you turn email notifications on. This means you’ll be notified via email for every single odds match that lands in your oddsmatcher filter. Yes, your inbox can be flooded by this at times. However, your bets and profits are likely to be increased nicely as a result. Pay attention to the emails as they come in and try to jump on the bets you can. You then click ‘Save As’, give it a name you’ll remember, and then click onto ‘Alerts’ to set up the email notifications. These are really important in my opinion. One of the more important factors with this type of offer is to be as dedicated as you can. If you spot a good odds match come through but you can’t get to a computer, try to place it via mobile. As long as you’re experienced enough to be doing so, if that’s outside of your comfort zone, that is. Try to get on as many close matches as you can, but also remember to try not to jeopardise your account health too much. You won’t be able to get on every match, avoid taking arbs, and don’t take them too early in advance. Although my filter is set up for 3 days in advance, I tend to only take them within 24 hours of kick-off. You can regularly get good matches after the teams are announced, so try to be available around 2pm on Saturdays – when a large number of teams are typically playing – if you can. Whilst I do recommend betting across a variety of leagues and competitions, it is important for your account health to not go overboard outside of the main competitions. These main competitions are the Premier League and the Champions League. Other leagues might well be popular in terms of supporters, but they don’t get anywhere near the level of betting liquidity that the two above get. This means it’s important not to make your account stand out too much by betting big on lower liquidity markets. I’ve been MB for 2 months and loving it. Taking it slow right now and still working through the sign up offers but want to get into 2Up with locking in profit to start. Hi, no you wouldn’t be in a loss because you’d have already been paid out for going 2up. The point of locking in a profit is so that it’s guaranteed, not so that there’s a chance of still losing money! I’ve been watching your YouTube videos and the 2up process has finally dropped, as has the extra place method.